Approximate weights, small to large: #20 = 1/80 oz., #14 = 1/60 oz., #12 = 1/50 oz. The SS-52 Panfish Cobra Ice Kit is the perfect assortment of Cobra jigs throughout the ice fishing season. The kit features the new tiny #20 "Mighty Mouse" Cobra, along with sizes #14 and #12 for Bluegills, Crappies and Perch. All Cobra's feature a unique offset Mustad, Kahle style hook that has no equal it its ability to hook and hold even the lightest biting fish. 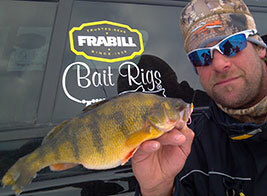 "As winter drags on bluegill get tougher and tougher to catch. Think small as fish are cold and prefer smaller offerings. I use a #20 Panfish Cobra tipped with one or two spikes rigged "kabob" style. This presentation is both small and compact, forcing light biting Gills to move up on the bait, resulting in better hookups."